The wait is finally over! MMS feature has finally landed officially for AT&T iPhone users – a feature which almost every other phone has had it for years. MMS for iPhone 3G and iPhone 3GS comes in the form of a small (a few kilobytes) carrier update (.ipcc) file which makes the update painless as you don’t have to download a whole new firmware update just to gain this functionality. The carrier update will popup as soon as you connect your iPhone to iTunes. Upgrading to iPhone firmware 3.1 is a must to get MMS functionality. Start iTunes and hit “Update”, you will be prompted to update your carrier file. Restart your iPhone after carrier file has been installed. 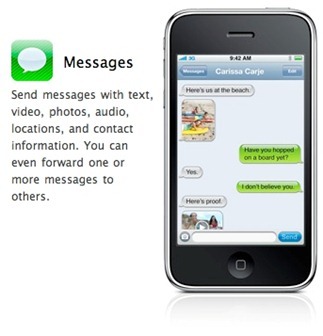 Now go to settings, then scroll down to Messages and turn on MMS! Those of you who followed my guide/tutorial here to get MMS early can safely update to the official carrier update (.ipcc) file through iTunes. iPhone 3GS: Do not update to firmware 3.1 when iTunes prompts you to as currently there is no solution to jailbreak 3GS running on 3.1. Of coarse MMS wont work for you on jailbroken firmware 3.0 or 3.0.1. Try this alternate method and see if MMS works for you on iPhone 3GS with jailbroken firmware 3.0 or 3.0.1.
iPhone 3G: MMS will work on iPhone 3G running jailbroken firmware 3.1. A guide/tutorial on how to jailbreak iPhone 3G running firmware 3.1 can be found here. Let us know in the comments about how is MMS working for you on your iPhone. Alright, I'm on a jailbroken phone running 3.0… if I hit update, all I get prompted for is the 3.1 update, please provide instructions about ONLY getting the carrier update. Anybody have issues on a jailbroken 3.1 3g with messages not sending? Regular txts go out, just not mms.. it stalls at the end of the bar. You can't just get the carrier update – “Upgrading to iPhone firmware 3.1 is a must to get MMS functionality.” And I won't advise you to update to 3.1… IMO (and that of thousands others complaining about it) it is buggy, drains the battery in a few hours (e.g. from 98% to 82% after a 10 min phone call), some apps crash on it, it locks up, etc. I am staying on 3.0.1 and waiting for the next version. F' the MMSs – AT&T can keep them. It is so retarded they kept the iPhone in the 20th century for so long… Now I don't even care to have the feature. Picture mms sends out with no problem, but I cannot receive any picture mms. My brother has sent 5 test pics from Verizon and they never show up on my iphone. What is the deal? Does MMS work with the 1st generation iphone also? All the blogs only mention the 3G and 3GS iphone. how do i jailbreak an iphone and install a spyware on my spouses phone?